four sweet kids..two with diabetes: Countertops, Omnipod, and Concrete. First, Kori is in Heaven now, rejoicing I'm sure. Her family here, however, is missing her. Thank you for praying for her..I'm sure you prayed her right into Heaven. You can pray for my friend, Kristin, and all her family. We don't have to understand God's ways. 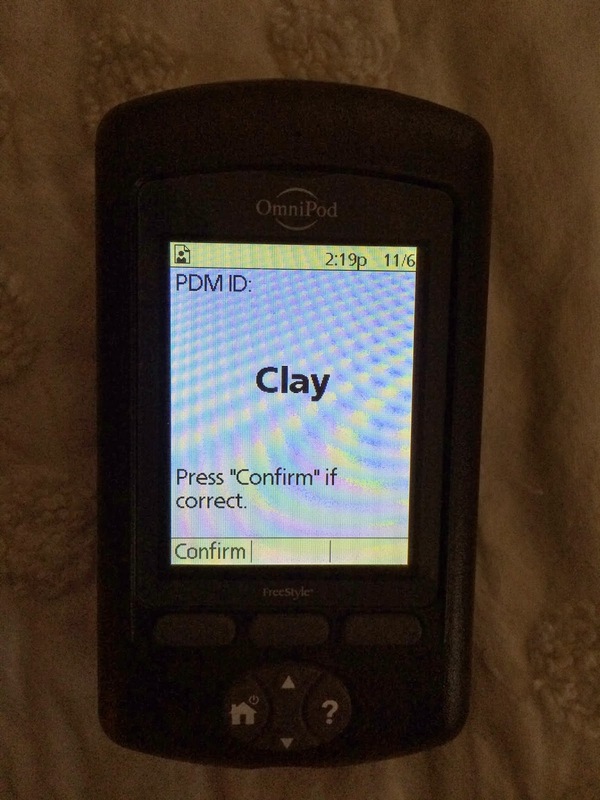 Second (and so comparably inconsequential), Clay has finished the Omnipod trial. It went well (pod-wise), but he forgot the PDM (personal diabetes manager, I think) at school on Monday! And the pod kept giving him a basal rate of insulin (thank goodness! ), but he couldn't use it for a bolus or a temporary basal! So..he went back to shots for eating. Then on Tuesday morning, he ate right before we got to school, and went into the nurse's office to get the PDM to give himself a bolus for breakfast. 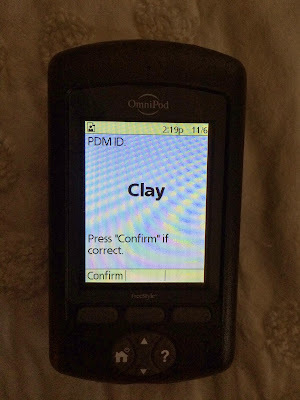 The PDM for his Omnipod. Must. Keep. It. Near. Child. He also forgot it on Tuesday after school, but sweet sister Mary Claire saw it in there when she got her meter, and brought it home for him! Then..before dinner, he lost it again, and I declared NO Omnipod. I just can't take the stress! I know, he's almost 13, and he needs to be responsible..it might get better after a week or two. But for now, we are back on Medtronic. Third, the house. ; ) We have counter tops! And we got all our door knobs yesterday, but it was too dark to take pictures. : ) I had some counter drama, and managed to get them all covered with cardboard by the afternoon, so we'll call that a success. Two were wrong..and we're talking Carrera and quartz. Not minor. But..they will be replaced. : ) Excitement. Yay!! It's so soft and smooth. I *heart* it. That shadow to the right is my huge SINK sitting on the island!! I kinda had a heart attack that they set a heavy thing on it. It's the beginning of the stress. ; ) But it's beautiful! Sink area. : ) The perimeter countertop is Black Pearl granite with a brushed finish. Not honed, not polished, but kinda textured if that makes sense. I'll show you a close up when we get electricity. ; ) Kinda looks like a soapstone, but much harder. And today? 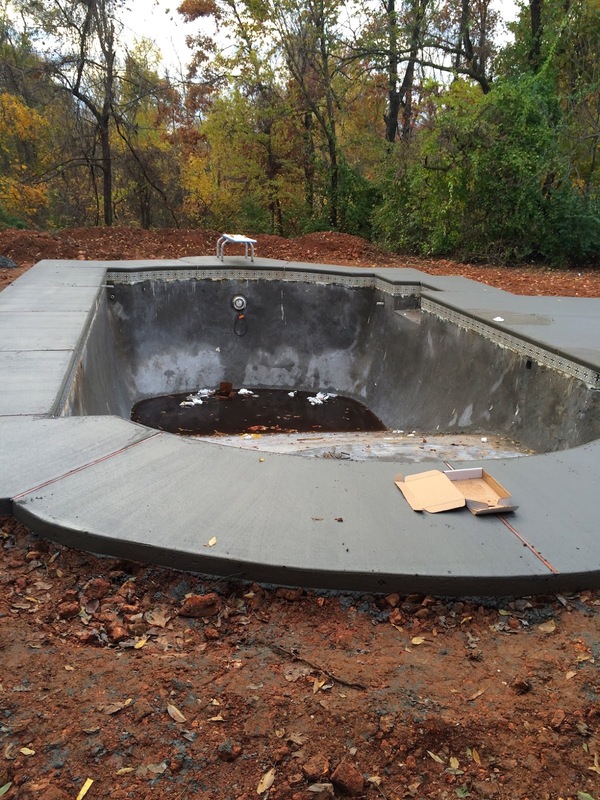 We got some pool decking, finally!! And today, we got tile! Wondering how long it'll sit there. I had to shut the garage door. I don't think they are too concerned with it being stolen. Ok, that's all I've got. I got my flumist shot (well..mist?) today, so I'm really worn out. That or it's all the stress from freaking out over counter tops and sealing them asap and white out lines on them and having to order a whole new slab of Carrera to make up the laundry room counter (I think there is one in Dallas?) 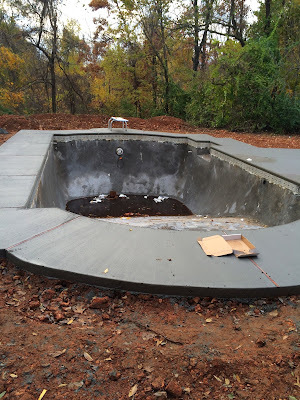 and the kids putting hand prints in the concrete decking, then Clay chipping a corner off, then Ethan leaning WAY into the middle by the diving board, and planting a big hand print in it..and then the mud they tracked into the car..whew. Yeah, I'm sure I'm way deficient on the details, but I'm falling asleep. ; ) God bless you and your angels. Hugs!